Welcome to Math Kangaroo - the International Olympiad in Mathematics with plenty of fun and learning! The regular participation fee is $21 ($20+$1; $1 is to cover processing fee). Financial assistance is offered to families in hardship; please contact finance@mathkangaroo.org. From December 16th till December 31st the late registration fee applies in the amount of $35. Families are welcome to register their children for any center that is listed during the enrollment period from September to the end of December each year. In some areas interest in participation is greater than the capacity of our centers. We advise parents to encourage schools to host the next Math Kangaroo. There is no monetary cost for schools and parents offer help eagerly. 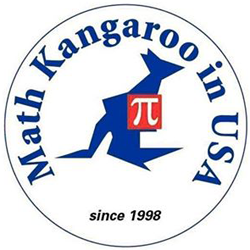 Teachers are welcome to bring the Math Kangaroo Olympiad to their schools; please apply for hosting permit from August 1 until December 1st each year. Some schools limit enrollment to their students only and they are not visible on the registration page by others. School Grade Level of participation is the student's grade at school. Participation at levels lower than the actual school grade level is not allowed. Parents/legal guardians are not allowed in the competition room. Please request the special accommodations need at the time of enrollment.